The Dallas quilt guild will be having its annual Quilt Show in early March, and we have a mini quilt auction to benefit a charity. This year it is the Children’s Craniofacial Foundation, which provides medical care and support for children and their families who were born with facial and head abnormalities. I had some extra hearts left over from my “row” quilt, and everyone liked the tall birds, so I thought this would be a fun mini-quilt. I’m calling it “Love Birds.” (the flimsy is resting on a white pillow). I need to decide what quilting to put in the white spaces (I will stitch in the ditch around all the hearts and birds. I’ve thought about some musical notes in some of the space or maybe some little hearts? I’d welcome suggestions. Also I think the binding will be either the hot pink or the pink/aqua print that is on the bird on the left. The size is about 17 x 22. I think I’d go with the teal for the binding. 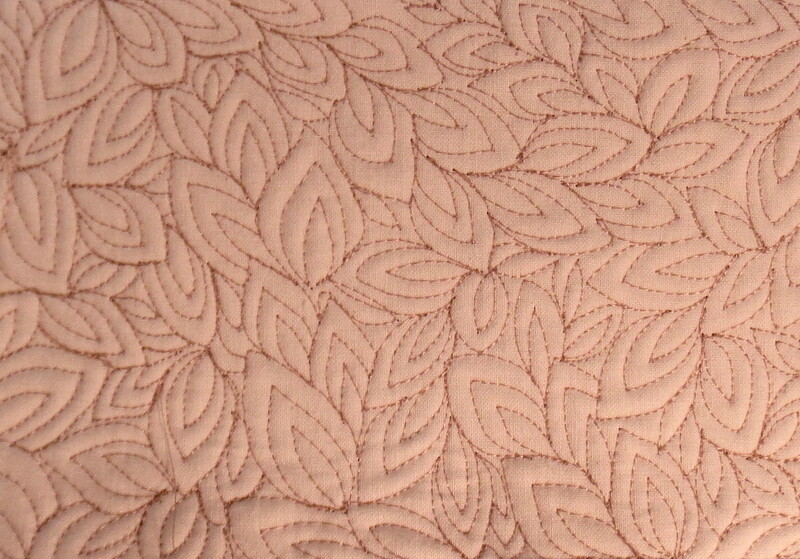 As for the quilting, I’d do something leaf or tree related like: Leafy Lines or Leaves. Or maybe a vine with a heart shaped leaf: Heart Leaf. That’s my two cents worth! I honestly think you could quilt it with anything–you don’t necessarily need to add anything to reinforce the theme of the love birds, though I like Andrew’s ideas and yours of adding musical notes, perhaps as if the lovebirds are singing to one another. 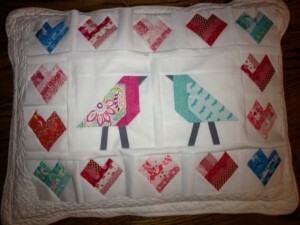 You could also go traditional with the quilting and put feathers in the whitespace around the birds (I know, me? Suggesting feathers … what a surprise). If you’re asking, I think I would bind it with a plain fabric instead of a print.